To preface this, no, we didn't actually eat Michelin-starred haggis. I'm not even sure such a thing exists. It was just something Rekha said that I thought was funny. Rekha and I have been talking about traveling together forever, so we finally did it! Neither of us had ever visited in the U.K. before, so this seemed as good an opportunity as any. We're both equally neurotic, so we booked this trip back in July, and within an hour had a full Google Doc of places we wanted to visit and things we wanted to do. You can follow her amazing travel Instagram here :). We spent four days in London, two days in Edinburgh, three days in Glasgow, and returned to fly out of London. It was amazing. Rekha and I still talk wistfully about the scones. I leave early morning for the airport with nothing but a small leather backpack to carry around, and a large hiking backpack stuffed with everything I'll need for the next ten days. This is truly a milestone because I have never traveled with such little luggage, except for maybe on my mini excursions around Southeast Asia. But those were weekend-long trips, and this is a whole week and a half. Packing was a test of will and minimalism. I am honestly very impressed with myself. If I bring anything home, I may have to wear it. I take public transport because Lyft and the Chinese cab service I use occasionally have had ridiculously high rates to the airport as of late. The downside is that it takes so long, even when you leave super-early. I once again consider the frustrating irony of sitting on a train doing absolutely nothing but being stressed all the same, and debate whether or not the $30 difference is worth arriving at the airport only two hours before an international flight. To be determined. Luckily, I make my flight without incident and land at Gatwick Airport. I haven't seen Rekha in ages, since June! Time flies. We eat a quick snack at Costa Coffee because both of us are starving after being in transit all day, and we take an Uber to our Airbnb, which is in a cute lil neighborhood on the East End called Bow. Both of us are very happy we decided to go with an Airbnb for the three nights we're staying in London, because this one is adorable. It's a cozy little flat with every amenity you could possibly think of, and both of us fall asleep almost instantly. We wake up in the early afternoon, mostly due to our odd sleep schedules and uncoordinated time zones of origin (she came from San Diego and I came from New York). We quickly get ready and head out to explore the neighborhood. I notice that the leaves are changing, which thrills me because it means that my first real fall is approaching (edit: It is now winter and I am now very cold but still thrilled!). Rekha is very amused because being from Michigan, she is already fully aware of the existence of seasons. But it's not that cold, which is surprising, as the U.K. (London in particular) is notorious for its gloomy weather. We stop at the Blind Beggar, which both of us have vaguely heard of from our research. We are greeted by a gaggle of regulars (it's around 2 pm in the afternoon on a Sunday, for context) and some of the best fries (or "chips") either of us have ever had in our entire lives. Londoners clearly take fries very seriously, which is perfect, because so do we. We pass by Leadenhall Market, which is gorgeous, but like a lot of other things, is closed on Sundays. I'm a bit disappointed because I adore markets, and this was one I was especially looking forward to, but it's beautiful all the same. It looks like it belongs in the Harry Potter universe—high arched-glass ceilings, columns trimmed in gold with stone gargoyles perched on top, red and green Victorian-style wooden storefronts, and iron lanterns dangling overhead. I love the charming cobblestone streets and ornate European architecture. Instead, we walk down to the river, to see the Tower of London and the Tower Bridge. I'm delighted to see two guys dressed as the Tenth and Eleventh doctors from Doctor Who. It's like the stars aligned to make sure I saw the most British thing possible on my first visit to London. The streets are quite empty, with virtually no one walking around, except for a crush of tourists clamoring over the Tower of London and the docks to the ferries on the Thames (pronounced "Tems" for all of you non-Brits, which I was unaware of). I guess because Sundays for most people are usually spent at home, but it's very odd. But we notice that most of the people we see out and about are all foreign; we pass about six different groups of people speaking French, and I have to remind myself which country I'm in. Finally, we go to the Sky Garden, which is high on the list of touristy things to do in the city. There really isn't much to do, per se, but it really is a spectacular view. London, like Paris, has very short buildings, so you can see everything, far across the sparkling stretch of the Thames. The inside of the Sky Garden is also incredible; it's this giant glass room with high ceilings and pink lighting, decorated with plants, two bars, and a lounge. It's like if Gardens by the Bay were a nightclub. For dinner we go to Liberty Bounds, which is apparently a very traditional English pub under the Wetherspoon company umbrella, according to Google. We note that alcohol is very cheap here. Good to know. We walk a bit along the Thames, which is very quiet but brilliantly lit, the reflections of the city lights wavering gently in the inky water. Empty cities always creep me out a little bit. It makes you feel very contemplative. You start thinking about how small you are. It's getting dark now, so we head back to the Airbnb, but not before stopping for some British snacks. We go to the Co-Op, which is an honest-to-goodness miniature supermarket adjacent a gas station. It has none of the seediness of an American gas station mini-mart. It's a literal miniature supermarket and it's adorable and I love it. I also just like picking up snacks from different countries, because they always reflect the flavors and taste preferences of the region (I noticed in Singapore in particular that many of the flavors were the same, but the flavor names were different to appeal to Asian consumers, which was interesting). We get some candy bars, including dark chocolate Kinder Bueno, which my roommate Ali introduced me to years ago, and something called "Wotsits" in "Really Cheesy" flavor. This raises some questions. Is there Mildly Cheesy? Regular Cheesy? Dangerously Cheesy™? And then we watch The Other Boleyn Girl while eating British snacks in bed, because what else do you do in England? That's right. Literal Roman baths. There are a lot of inefficiencies in the metro system, not necessarily in the way it runs, but in the way you use it, which is annoying. I don't understand purchasing tickets by zone; it all appears very arbitrary. Nothing infuriates me more than public transit inefficiencies, because it's just wasted time. I think Singapore's MRT is one of the best examples of public transit, but a) It's very small, so it's not necessarily scalable, and b) It has an expensive payment system, where you pay the same for a one-stop trip as a 30-stop trip (New York does this too). Who designs these, honestly? I feel like there are much better ways to do this. We pass Westminster Abbey on our way to the station, which is stunning, but we don't have time to wait on the line to go in. Instead we admire it from afar—all Gothic cathedral-looking stonework and vaulted glass windows. There's a window built for King Henry VIII and Catherine of Aragorn, which Rekha speculates was an unwitting metaphor for the fragility of their marriage. It makes a very pretty landmark, though. There's an alleyway off of Victoria Street that has little tents up, so naturally we go investigate (little tents usually = street fair!). It turns out to be street food fair, which is even more exciting. I'm torn between a French booth and a Middle Eastern booth, but Rekha remarks, "I feel like brown people food is probably a good bet here." This is a good point, and it's a good choice because the lamb is excellent. And the rice. Oh my god, the basmati rice. I don't know what's in it, but it's so flavorful and fragrant; it's amazing. I could eat an entire bucketful of it on its own. It's little things like this that make me convinced that I will never be a great cook, because some people can make even plain rice taste great and I struggle with things like browning butter sometimes. We make it to Victoria Station and make it onto the bus, which is surprisingly clean and comfortable. I try to sleep, but there's so much to see. I always marvel at the little things in new cities, like the vaguely San Franciscan hexagonal façades or the little dashed bus stop boxes painted on the street. I didn't know I was interested in city planning until now. It's also fascinating to watch the bus weave in and out of traffic, in lanes that look much too narrow for it. I'm reminded of the Knight Bus in Harry Potter, compressing itself to fit between cars. I notice that they also have Megabuses here in the U.K., advertising rides from just £1. I forget that the U.K. is our parent sometimes, and that it's not as foreign as a country as I expect it to be. When I open my eyes, we've arrived in the English countryside, specifically in the little town of Chippenham. I realize I don't know that much about it, as most books and movies set in England take place in London. It's exactly as green as I expect; I don't think I've ever seen any place this vibrantly green before. All the buildings are short and made of stone, with colorfully-painted wooden doors. Here, it's apparent that the lanes are exactly as narrow as they appear, because sometimes the bus has to wait for cars to pass before it can move through particularly narrow tunnels. There are lots of cows, of course. I've never seen this much open space in my life. Certainly not in California, and never this green. I really don't think I can overstate how green it is. The rolling hills go for miles, and even under the grey, overcast sky are a deep, Windows desktop-looking green. It's unbelievable. There are some places in the world that are just really naturally beautiful, and it makes me sad that some people don't get to see them, but at the same time, it's probably best that they remain this untouched. We arrive in Bath, which is, predictably, adorable. All of the buildings look appropriately regal, made of soft, honey-colored stone with imposing columns and peaked rooftops. And the cobblestone streets do really remind me of Rome. People look so strangely anachronistic here, wearing modern clothing and carrying paper shopping bags, strolling past buildings that look built for gladiators. 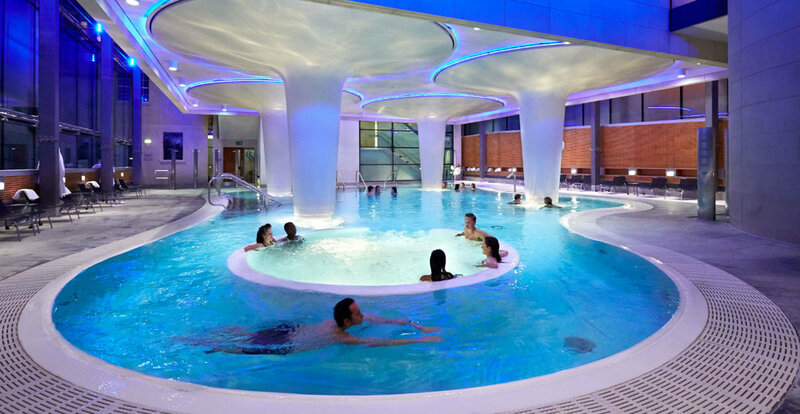 Our appointment is at the Thermae Bath Spa, where you can bathe in the natural, mineral-rich spring waters, and which Rekha found by literally Googling "taking a bath in Bath." This is truly a magical place. The water is warm and soothing and I feel as though I could fall asleep. I've never been this blissfully relaxed in my entire life. I feel as though I'm leaving my earthly body behind and disappearing in a wisp of smoke. We admire the view of the whole city from the rooftop deck and laugh at the absolute absurdity of us being here. 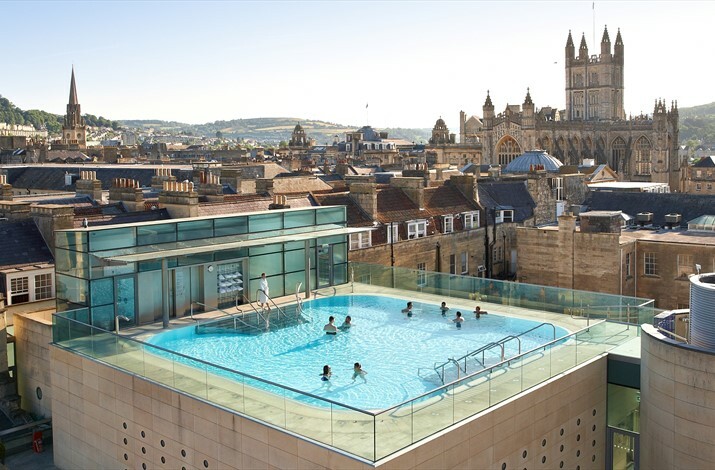 This is why we knew we would be good travel companions—we're both equally willing to do ridiculous things like book a spa day in Bath in the U.K. that we have done absolutely nothing to deserve. But we decide to live by the wise words of Tom Haverford and Donna Meagle and treat ourselves, and we congratulate each other on a very well-planned day. We eat dinner afterward, which is included in our spa package, and we feel sufficiently pampered in our spa robes and slippers, casually sipping wine by the window of a restaurant overlooking the dimly lit streets. I can't quite believe this is real life. Who even are we. The absence of people was definitely a Sunday thing, because everyone is out and about today. And everyone is dressed so fashionably, most noticeably the men, who wear nice coats and well-tailored suits. I can't tell if they're actually attractive, or if I just like their accents and how nicely they dress. Spotting Pret A Manger has become a game, almost like punch buggy. There is literally a Pret on every. Single. Corner. It's more common than Starbucks, which is fascinating. A quick Google search reveals that the headquarters is in London. Go figure. Our first destination of the day is Tate Modern, which I'm pretty excited about. This is one of the great art museums here, and it's particularly known for its (you guessed it) modern and contemporary art. And it's free! I sometimes get really offended when art museums are expensive, because while I acknowledge that you have to support the arts...I feel like art being accessible to the public is a good thing for everyone. Plus, when I think about how much food $30 can buy, it breaks my heart a little bit. That's what billionaires should do instead of buying art. They should open museums, and make them free for people to enjoy and appreciate. Art shouldn't be elitist. The first exhibit is all about sculptures as independent objects rather than imitating nature, thoughtfully arranged in the space. Every piece in this room has been carefully placed to reflect the artist's intentions, which is pretty cool. Like this piece by Yayoi Kusama (best known for her "Infinity Mirrors" exhibit in The Broad in LA), called "The Passing Winter," a cube lined with mirrors to give the illusion of infinite space. According to the description, "the appearance of the interior is affected by external conditions, such as the brightness of the room it is in, and any surrounding colors which can be caught by the mirrors." It's a really interesting example of deliberate curation. I never really thought about the effort that goes into curating museum exhibits, until I interviewed at this agency in San Francisco where one of the strategists was a former curator at the Museum of Islamic Art in Qatar. It turns out she'd gotten her job as a strategist because she was already accustomed to creating narratives and designing user flow out of given data; in that case, art. So rad. Or this one, which portrays the failure of "open form" theory, or the practice of individuals creating their own environment, in the destruction of post-Communist Poland's modernist buildings. I think the mistake people make in art museums is thinking that they have to like or appreciate every single piece. We spend a little bit of time in Tate Modern, but neither of us really like modern art, and I think we finally can articulate why. Some modern art is very intentionally symbolic, but a lot of it just feels...little bit lazy. And given that modern art is a lot of social commentary, I don't think it's outside the scope of the imagination that a lot of these artists were commenting on the way we consume art, and the arrogance in assuming that we can always understand art. It's a little bit patronizing when artists presume that it's their personal social obligation to push you out of your comfort zone or create art using shock value for the sake of shock value. I think I like classical art because it feels more personal, rather than performative or so heavily reliant on the evocation of a particular reaction from the viewer. Of course, this is all from someone who doesn't know a lot about art, but I know what I like, and I think that's why I tend to enjoy the Met over MoMA, for instance. I did see a Vox video on "blank" white canvases as an expression of Minimalism (with a capital M), and its core tenets of order and harmony, which made me understand it a bit more. But I also think art should be open to interpretation; while you can create with intention, art is designed to be both implicit and explicit. We eat a quick dinner at Dishoom, a fantastically hip little Indian food place, and then our next stop is Sketch Tea, which was highly recommended by pretty much everyone. Rekha and I were insistent on going to a real afternoon tea, and we decided to be really extra about it, because we could. The best way to describe Sketch Tea is "otherworldly." I'm not sure what I was expecting when I made the reservation, but it wasn't this. Apparently it began as an attempt by a French chef to revolutionize afternoon tea. It's a cotton candy-colored heaven that's equal parts quirky and elegant; what I imagine the Plaza Hotel would look like if Eloise had actually designed it. It's so beautiful. It's filled with plushy millennial-pink tea chairs, the walls decorated with weirdly dark and sometimes snarky black-and-white sketches. It's magical. Life cannot get any better than this. The pot of jasmine tea that I choose is perfect. I'm convinced jasmine tea is always the right choice, regardless of country (re: Paris). Our tea begins with an appetizer of caviar (because of course), and then we're served an assortment of little sandwiches and cakes. But the highlight is, predictably, the scones and clotted cream. I think these are the best I've ever had in my entire life. The scones are warm and the perfect fluffy texture, and the clotted cream is just the right amount of sweet and light and rich and buttery. This is by far the best decision we've made this trip. And that's taking into account that we went to a spa yesterday. "My dear if you could give me a cup of tea to clear my muddle of a head I should better understand your affairs." We were planning on getting dinner, but we're both too full, so we settle for the next best thing: a pub! Specifically, pub trivia, which is one of my favorite things. Once again, we are the youngest competitors. And at a bit of a disadvantage because we're not British. We don't win, but the important thing is that we aren't last. This one was tricky as it was a lot of British trivia, like naming the tube stations based on word clues or identifying famous cricket scores from the first letter of every word in a sentence (how?! ).‎ The man running the trivia night is this adorable old man who keeps coming around every couple of questions to make sure we're doing okay. So cute. It's early. Too early. I don't believe in rising before the sun is up; it's just not natural, but we have to catch a flight. And as our three most recent Nobel Prize winners determined, some people are not meant for mornings. We take one of those little Ryanair planes, little enough to have to board via a stair car, and probably around three rows short of having a propeller. When we arrive, it's grey and sprinkling, with a thick layer of fog woven through the evergreen trees that line the runway.‎ The walls of the airport are decorated with quotes by famous authors about the beauty of Edinburgh, which makes me very excited because I've heard about the famous Edinburgh landscape. I pray that it clears up, but it's still only 10 am. I pass another poster, this one with Scottish men wearing kilts and drinking whiskey, and all I can think is, Oh my god, people wear kilts here. I already love Scotland deeply. We hop in an Uber to our hostel. On the way, we pass rows of cute little houses, made of stone and brick, with little peaked rooftops and stout chimneys. And I do mean little; they all appear to be one-story and very short. In contrast, there are some manor or chalet-looking homes (I'm pulling all out my real estate knowledge here), with blue-trimmed brown or white façades and protruding alcoves, and large churches with beautiful cathedral-style stained-glass windows. God, people from other countries probably think our architecture is so hideous. The radio plays Sam Smith and whoever sings "Castle on the Hill." I wonder if there's Scottish pop? All I can think of is "500 Miles" by The Proclaimers. It's so strange to think that some countries don't have a native commercial music industry. And perhaps even stranger that the U.S. does. When we've almost arrived at our hostel, Rekha nudges me. The massive Edinburgh Castle looms out of the mist, atop a lush green hill. It's majestic for sure. I still can't quite believe this is real life, or that people actually live in this town. Our hostel is a hip little thing right in the middle of the Royal Mile in the Grassmarket area, literally in the shadow of the castle. It's such a stark contrast of old and new, eclectic neon signs and colorful wall murals against the imposing grey stone of the castle. We walk around a bit, venturing up Victoria Street, which looks very familiar—apparently, it was the inspiration for Diagon Alley. The whole street curves around slightly, housing colorful shopfronts and little cafés. It all feels very whimsical. We also pass St. Giles Cathedral, which is...stunning. We sit in on a service, which is interesting because I always wonder about how really old religion adapts to modern society. But I'm mostly there for the architecture. I love temples, mosques, churches, etc. specifically because they're always so gorgeous. This one is probably one of the prettiest I've seen, except for maybe the Hagia Sophia in Istanbul, which from what I remember was pretty spectacular. It's raining now, so we take shelter in The Royal McGregor, a little family-owned pub. I order haggis fritters and some steak and ale pie, because you have to try haggis in Scotland. I admit‎ I'm absolutely terrified, having only become an adventurous eater a couple of years ago (and since then, the only really unusual foods I've tried have been escargot, frog legs, chicken feet, and pig intestines). For those of you that don't know, haggis is a savory pudding made of sheep's heart, liver, and lungs, served wrapped in the lining of the stomach. I don't think they do that last part anymore, thank god.‎ But it's surprisingly delicious. It's seasoned very well, and I guess hundreds of years of eating it have allowed the Scots to perfect their recipe. It just tastes like fried meatloaf, with sweet chili sauce on the outside. I try not to think too hard about what exactly it is that I'm eating. But it's very good. I'd recommend it to anyone. We go up to Edinburgh Castle, but don't actually go in, as neither of us are too wild about castles. The view from the hill is picturesque on its own. We're both exhausted, so we go back to the hostel and nap for a bit, and then head out to pub trivia again, this time at Moriarty's Bar, a Sherlock Holmes-themed bar. It's cute, with bookshelves painted on the walls and cozy little booths in the corner. I feel like we did better this one! Each round was themed, like geography, music, food, film; the team names were themed also: "Things Worse Than Scottish Football." Ours was "American Politics" of course, because we had to. But I think my favorite was "Not Getting Your Independence From Spain" (this is right as the Catalonia riots are happening). Too soon? But I think the important takeaway is that it is possible to do trivia in other countries, which is promising. Things close very early in the U.K., it seems. One of the only other places open on this street is The Hanging Bat, which is this cute little rustic-looking bar with a loft, but also, both sweet potato and Cajun-spiced fries. And of course we buy more snacks, including these very strange Twisted Cheetos that claim to be "Flaming Hot" but are still orange and not hot at all? And just a little bit sweet. Why is everything sweet in the U.K.? I read that British people think America is weird because our white bread is basically cake and our breakfast foods dessert, but so far I've found a lot of foods (ketchup, Cheetos) that are sweet that should not be sweet, in my opinion. Very weird. Also, I take my Flaming Hot Cheetos very seriously. If they're advertised as "Flaming Hot," I want them to burn my tongue and I want them to be bright, artificial red. It's only right. In the morning (or more accurately, afternoon), we decide to head to a place called Arthur's Seat, an ancient volcano and the highest peak in Holyrood Park, which Robert Louis Stevenson called, "a hill for magnitude, a mountain in virtue of its bold design." It's not an exceedingly difficult hike, but it was a mistake to wear jeans today. And there are a lot of steps. A lot of steps. Honestly, I was not prepared for physical exercise this trip. I am very out of shape. But the view on the way up the volcano gets prettier with every step I take. The only thing is that the sun is playing hide-and-seek and the lighting refuses to stay consistent. It is...absolutely incomparable. Edinburgh is such a gem. I don't think I've ever seen anything this naturally beautiful in my entire life. And I'm not sure I'll ever see anything this beautiful again. It's one of those places that stops your heart a little; when you're staring out at the grandeur of it all, it's quite literally breathtaking. You can't help but savor the freshness of the air and the deep richness of the colors enveloping you and the way everything stretches for miles before your eyes in a gorgeous panorama. I've always considered myself a city girl. I like the cosmopolitan landscapes of cities, I like the noise, I like the aliveness. But standing on top of a volcano, staring clear across the jewel-blue North Sea at the lush coast of Scotland, with the wind in your hair and the sun warming your skin, and feeling like you're on top of the world, is like nothing else. In this moment, I feel like I could live here happily as a sheep farmer for the rest of my life. Rekha and I hang out at the top for a while, lying in the grass and watching thin rays of sunlight reach through shifting clouds. It's breathtakingly pretty when it hits the water; it's absurd how blue it is. Everything is so vibrant I can't believe it's real life. The pictures I'm taking are nothing but bleak, disappointing echoes. After a short walk back to the hostel, we meet Carl from York, Michael from Brisbane, and John from Oklahoma. We all head out to trivia together at a nearby pub, but it's too loud and they insist on using an app to submit answers, which is dumb. So we once again return to the hostel and play pool and Scrabble. We make a tentative plan to meet up in Glasgow—as it turns out, they're interested in seeing the same loch that we are. We take the early morning ScotsRail train from Edinburgh to Glasgow. Early travel appears to be a recurring theme this trip, and it sounded good in theory when we booked it three months ago, but I'm really regretting it now. One of the travel websites I visited described the difference between Edinburgh and Glasgow as, "Edinburgh is big and ancient and Glasgow is small and modern." Glasgow reminds me of a much smaller London. It has highways, for one, something Edinburgh conspicuously lacked. I love seeing how cities evolve. I think it's so fascinating. We have to find ways of building around things that already exist, preserving them the best we can. It's this beautiful mix of old and new. I'm always conflicted about this. I like the grit and essence of old places; it always feels so steeped in culture and old-world charm, But I'm so inspired by technology and innovation and clever design, little things that make living and existing better. It's a balance, for sure, but I think when you're so accustomed to a certain standard of living, it's hard to know exactly where the line is. I have a lot of thoughts on technology and social responsibility. Blog post coming soon. Our Airbnb is a little one-bedroom flat; cozy, but very cute and a much-needed improvement from having to share showers with the whole floor. We go to the Kelvingrove Art Gallery and Museum, which was built in the 17th century, a beautiful Gothic-looking building straight out of a Victorian romance. The gloomy, rainy weather perfectly accentuates the Edgar Allen Poe-ness of it all. It's even prettier inside: high arched ceilings, glossy checkered marble floors, and a shiny brass organ perched on one side of the balcony. I'm very particular about art, but I love two things: clothing on statues and impressionism. What amazes me about impressionism is that it's composed of all these tiny little brushstrokes and up close it looks like a mess, but when you take a step back, you see that each stroke, each color, has a very specific purpose. Google says it's characterized by "[the] inclusion of movement as a crucial element of human perception and experience," a concept I think is really interesting because it captures very fleeting moments in life and nature in an abstract way, a departure from the very detailed and hyperrealistic historical paintings of the era. I think that's why Renaissance art doesn't interest me very much. "The pretty stock-transfer pictures of flowers, birds, and countryside contrast with Perry's drawn imagery which wittily explores male inadequacies in relationships. Macho bravado is alluded to through a hunting scene, fast vehicles, and alcohol." I've always liked Monet, I think partly because I was introduced to him at an early age in elementary school art classes. But I didn't know he was essentially a pioneer of the movement. Impressionism was literally named after one of his works, Impression, Soleil Levant ("Impression Sunrise"), by one of his critics who actually disapproved of his style. Some of the other artists I like: Alfred Sisley, Eugène Boudin, and van Gogh. I like the motion and life in their paintings. Looking at their blue skies is like taking a deep breath of fresh air. And I love the way the water is painted. If I stare long enough, I swear it moves. "Matisse believed the purpose of painting was to communicate joy and happiness. He wanted the viewer to notice what was around them, and by contrasting shapes and colors, he brings a fresh viewpoint to everyday things." We have tea again, this time at Willow Tea Room, accompanied by scones and clotted cream (surprise) and some ridiculously decadent caramel apple pie. I don't think I've ever met an afternoon tea (or evening tea) I didn't like. We take a train to Balloch in the morning, so we can catch a bus to Loch Lomond, a famous lake and national park. Rekha did some research a while ago and it looked gorgeous, so of course we had to go. It's raining a bit and very grey out, but the loch is as beautiful as ever. I can't even imagine how incredible it looks in the summer when the sun is out. But the trees dotting the loch shore are as vibrant as ever, little pops of dark evergreen, burnt orange, and velvety red; a stark contrast from the grey skies and the mist settling over the loch. We walk around for a bit, but there's actually not that much to do. The road near the loch has little souvenir shops and pubs where the locals crowd, especially in the rain. It's just a really pretty place to be, perfect for a grey fall day. Rekha and I split up, her back to the Airbnb to charge her laptop and me to the West End. I walk around the University of Glasgow for a bit. It's actually a little unfair how pretty this campus is. It's awesomely majestic, with ornate stone towers and candy-colored glass windows. It looks like a place in which you could get lost—secret corridors and hidden room begging to be explored. The quads are nice too, Narnia-esque gas lanterns and stunning stonework. I missed Notre Dame when I was in Paris, but this is what I imagine it looks like. That and Hogwarts. I half expect to see owls flying around. My friend Eileen from Singapore actually studied abroad here, but she failed to mention that she went to classes in a castle every day. We end the night at Old Salty's, a very traditional fish and chips kitchen (how have I still not had fish and chips in the U.K. yet?!) and are immediately intrigued by something called a "macaroni pie." As it turns out, this is just mac and cheese in an edible pie crust. Amazing. Dear diary. It has been almost a week and a half of nonstop exploring and jet-setting and I am exhausted and have given up hope of ever feeling clean again. Rekha and I jump on a flight in the early afternoon back to London. And we're excited, because more tea and scones await us on the ground. We'd ambitiously booked afternoon tea earlier this morning after seeing that a teatime slot had opened up at the Barbican Conservatory, even though it was only an hour after our flight was scheduled to land. Now, we're scrambling and the airport is far, so we take everything with us—my giant backpack, Rekha's little suitcase—and Uber directly to the conservatory. The conservatory is one of London's hidden gems. On the outside, it's a massive yet still unassuming concrete monstrosity. But inside is a museum, a theater, and an indoor garden, which is where the tea is. It reminds me again of Gardens by the Bay, or the botanical garden at Balboa Park back home. The tea is delicious, as usual, as are the tiny little cakes they serve us. I think these scones are the second-best ones we've had on this trip after Sketch Tea's. But the real treat is witnessing the most supremely awkward first date right next to us as we sip tea and champagne and eat tiny sandwiches. It's hilariously cringeworthy. The guy is pulling out his phone while she's talking. She's telling him that she's never had a relationship before. He seems kind of pretentious. I hate that. This is not a good place to start with dating. Girl, run. So now it's back to the hostel, but we stop at Boxpark, in Shoreditch (pronounced "Shortage") first. It's a little pop-up mall in a converted shipping container, complete with modern street food and hip vendors (the most hipster), one of which is The Ordinary (I use their foundation in the summertime)! I've never seen a brick-and-mortar store before; in fact, I think they're deliberately direct-to-consumer. But it's pretty cool. The Wombat City Hostel is probably the best one I've been to. It's cute and modern, with little eclectic decorations and an underground bar with stone vaulted ceilings ("The Wombar"). It looks like an actual hotel, and the rooms remind me of FT, but with much nicer showers, praise the lord. It has none of the grime of our Edinburgh hostel. If you ever find yourself in Berlin, Budapest, London, Munich, or Vienna, I'd highly recommend them. We go to pub trivia at The Coborn down the road from our very first Airbnb. This one was really tricky. We knew almost none of them. I suppose we'll just blame it on the fact that we don't have a home field advantage. Maybe we'll only count Wham! 's track record in the States. Back at the hostel, we meet Josh from Canada, Naomi from Michigan, Steve from Australia, and two Italians whose names I don't catch. We all grab drinks downstairs at the bar and order pizza. This is exactly why I love hostels. You meet such interesting people; well-traveled, adventurous people willing to venture out of their comfort zones and have a beer with strangers, etc. Today is our last day in the U.K.! It feels like we've been traveling for years and although I've loved every second of being here, I am also exhausted (said my mother very sassily, "What, you need a vacation from your vacation?"). Rekha leaves early morning for the airport because her flight to San Diego's a bit ahead of mine, so Steve, Josh, and I go to breakfast at a café down the street from the hostel. We've got a couple of hours to kill, so we loop back around to the Westminster Bridge, Big Ben, and Westminster Abbey. We finally get to see Buckingham Palace! It's surprisingly understated. Not at all what I'd assumed the royal family's house looked like. Nothing like Versailles. I can't believe the guards still dress like that. In ever country I've ever been to with a palace, the guards are always wearing very traditional outfits. I suppose you don't take the job without knowing what your uniform entails. We walk around St. James's Park, which actually has a lot of really interesting/strange history, but looks picture-perfect right now, with lush green grass and colorful fallen leaves. It's a beautiful day, which apparently is a very rare thing in London, and everyone is out and about, playing, lounging, and picnicking on the lawns by the miniature lake. And finally, it's time to go home. After a very unintentionally stressful train ride to Gatwick, I'm on my way back to America. I really loved it here. I think Edinburgh was my favorite—it was so unexpectedly beautiful and such a departure from the noisy, crowded cities I'm used to. There are so many things on our list we didn't get to, not to mention we opted out of Ireland in favor of spending more time in each city instead. I can't wait to come back. So until next time.